Pastor TB Joshua alongside other trustees of Synagogue Church of All Nations, SCOAN, will today be arraigned before a Lagos State High Court in Ikeja over the collapse of a six-storey building in the church on September 12, 2014, which led to the death of 116 persons. 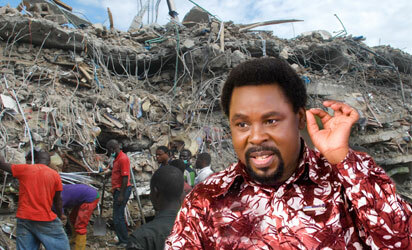 The trustees will be arraigned before Justice Lawal Akapo alongside the engineers that constructed the collapsed building. A statement by the Deputy Director, Public Affairs of the Lagos State Ministry of Justice, Bola Akingbade, confirmed the scheduled arraignment.